What is it about tiny things that captures our attention? From miniature figurines to tiny houses, small items, especially those with precise details, make many people stop and smile. As I was searching for swag ideas, I came across tiny books. 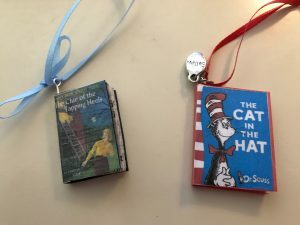 Someone was taking well-known books (the classics and some colorful children’s books) and creating little reproductions to hang on ribbons as bookmarks for friends. They were adorable. So, I decided to make some with my own book covers. I originally wanted to make one-hundred bookmarks for a conference using my various covers but quickly found that to do a good job I had to take my time. Making one-hundred in a month wasn’t going to happen. 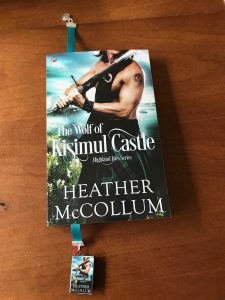 Instead I make about ten at a time to use as special prizes and gifts for my street team members (Heather’s Highland Roses). Tiny books make great holiday gifts. 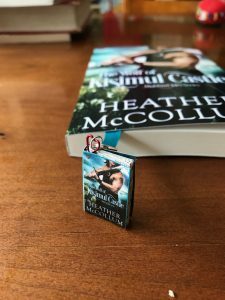 You can choose a person’s favorite book or a traditional holiday tale, and make it into a bookmark or a tiny tree ornament or even earrings. Here’s how I make them. Create a word document with text boxes or make a label template, and insert an image of your cover. If you have the back cover, insert that as well, with a little space open for the spine. Adjust the size to your desired width and length. For bookmark tiny books, I used 1.5 inches high X 25 inches wide to include the entire cover flat. Print using color and high print quality onto regular white printer paper. 3. 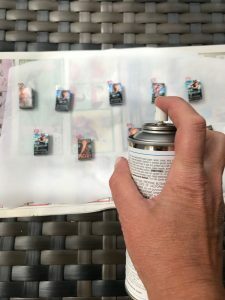 Glue the covers, with mod podge, onto card stock and carefully cut out when dry. 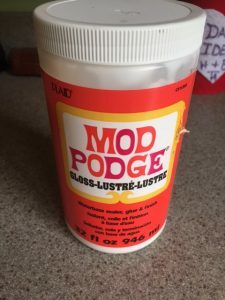 Apply mod podge to both sides of the card stock/cover, allowing each to dry. 4. On one side (the exterior side) score the two lines on either side of the spine to allow for easy bending. Now to make the inside pages. I used a copy of an old book but you can print copies of pages out of some classic books (I did this with Pride and Prejudice for my mom). 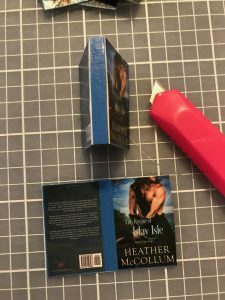 Measure and cut a strip the same height as your tiny book. Accordion fold the pages. 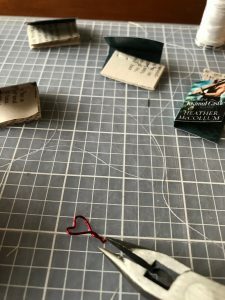 Place two or three accordion folded bunches together and either sew at the binding or staple them together (sew for a much more authentic appearance, it’s not that hard, but if the pages are thick make punctures with an awl for your needle holes). Trim the edges so that all the interior pages fit within the cover. Create/buy a wire loop and glue it on the inside of the spine so the loop sticks out the top. I bent my wire into little hearts and used a dot of hot glue to attach. Try to make this as flat as possible so the pages will fit inside without going wonky. 7. Run a line of hot glue down the inside of the spine, and glue in the inner pages of the tiny book. Allow to dry. This takes some maneuvering if the wire loop is thick and gets in the way. 8. Set the tiny book on a piece of wax paper on a tray or board. 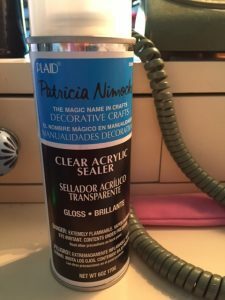 Carry to a well- ventilated area (like outside) and spray one side with a clear acrylic sealer. Wait for it to dry 10 minutes (or however long it says on the can), then flip and spray the other side. 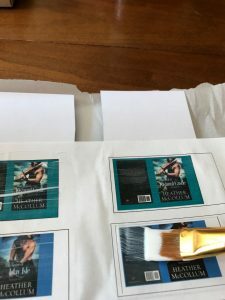 This is mostly for the covers, but the pages can handle a little sealer as well. I applied two coats on each side, making sure I also sealed the spine. 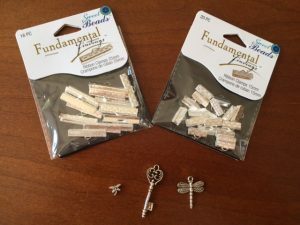 Once dry, attach a jump ring or twine and create a bookmark, ornament, earrings or whatever you can come up with. There are lots of ways to make bookmarks. I found cutting a piece of ribbon, and clamping it with these fearsome toothy alligator-mouth looking things, worked the easiest. Make sure to cut the ribbon long enough to stick out of each end of a typical book. Add a charm to the other end of the ribbon and wa-lah! Beautiful, unique and personalized! 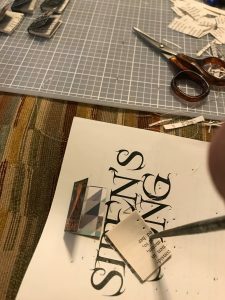 Have you ever made tiny books? Any tips on a faster, easier way to make them? If you’d like one of my tiny books, e-mail Heather@HeatherMcCollum.com and I’ll make you one with my next batch! I love these bookmarks!!! Everyone thinks I’m crazy, but I love books better than ebook! I have both but I love the smell and feel of a good book!! So this is a great idea!! !